There's only so much space in your life—physically and energetically. Whatever you put your energy on (be it good or bad) will only intensify and attract more of the same to you. 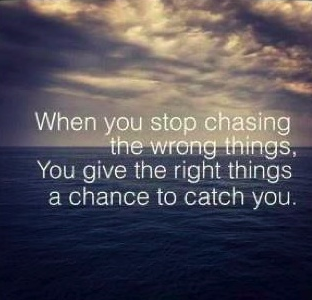 So focus on choosing only the things you want, and make room for them in your life. You have to close one door before another can open; end one chapter before another can begin. This deliberate act of creating space in your life sends a powerful signal that can draw all the right people and things into your life. So do not ask why the right things have not found you. Instead, recognize if you've been "unavailable" to receive? Perhaps you've been busy spending your energy chasing the wrong things? Could today be "the day" for you to close a door, or end a chapter so a new one can begin?